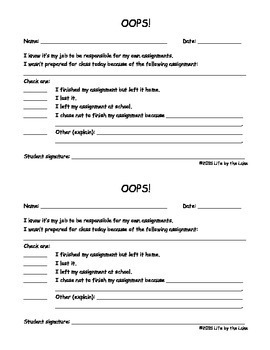 This form is used when my students are unprepared for an assignment in class. The student fills out the paper and hands it in instead of the assignment. It is a form of accountability and helps me track unprepared/missing assignments. This does not excuse them from completing the work and turning it in at a later time. When they have completed the work, the student gets the form from their personal file and staples it to the original assignment. After the assignment is recorded, the slip is kept in the student file and can be brought out for parent teacher conference, if needed. Created by Life at the Lake.